Today’s 31 Days of Free Writes word is PURPLE. CONFESSION. A few weeks ago Kate sent out a survey for readers/bloggers/whoever to pick words for the 31 Days of Freewrites. I filled out the survey with a ton of REALLY RANDOM words and guess which word was one of them? Yup that’s right this word – PURPLE!!! So yay me for winning! Anyone that knows me knows that PURPLE is my favorite color. I have tons of clothes that are purple, bags, luggage, highlighters, and even a ruler. When I was in college I had purple bedding, a purple surge protector, and a purple trashcan. I’m not sure when my obsession for the color purple began. I remember at one time picking purple over Pink because it was still girly but not as girly as pink. Now that I have written that out it sounds really ridiculous but it is what it is. Everyone has a favorite color that is just THEM. When people see something purple they know it’s me. It’s kind of my brand. I have seen people see purple things and buy them for me (thanks mom) or send me pictures. es more than one person likes my favorite color but they may not like the same shade as me or they may use it differently than I. At the end of the day pick a color that makes you you and spread the word of your vision!! 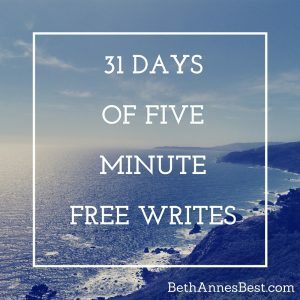 This is Day 8 of my 31 Days of Free Writes Challenge. Go check out my landing page for more words.